But as Carrie's mind slips back in time, she learns of the ultimate betrayalthat happened all those years ago, making her the only living person who knows the truth**—**and that knowledge comes very close to destroying her. Not bad, a little slow at times, historical aspect was good. Loved every minute spent reading this book. I will be looking for others of hers. 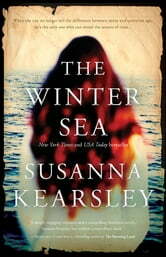 So very much enjoyed Winter Sea and Kearsley's writing. She kept me engaged and wanting more. Carrie is a historical novelist and has come to Scotland to research her new novel that will be set in a little known 1708 Jacobite Rebellion. The Scottish involvement in her story was meant to be minimal but when she arrives at Slains castle near Aberdeen, her characters start telling their own story. Her heroine, Sophia, is her own ancestor. Carrie finds the area familiar though she's never been there and as she writes the story of Sophia, she discovers that the details she thinks she's writing from imagination are real. How does she know these details? The romance between Sophie and John Moray is really well written and believable. The historical details are well researched. The book takes place in the present day as Carry is writing her book and as she's falling in love herself with one of the two sons of the man from whom she's renting her cottage by the sea. We also get to read Sophia's story as Carrie is writing it. It's a bit of a different twist on "time travel" where Carrie isn't traveling back in time but appears to be "remembering" it though Sophia's words. The only parts I felt were a bit dragging were a couple of "history lessons" that one or another of the present day characters would describe to Carrie, filling in the back story for some of the historical events. While it's good to know these things, I felt it stopped the flow of the story cold. I still really enjoyed the book and would recommend it.